What Is A Smart Solar Inverter? The growth of the U.S. solar market over the past five years has been remarkable, with the total number of photovoltaic installations climbing into the hundreds of thousands. This is impressive, but it’s still just a drop in the bucket compared to the tens of millions of rooftop and ground-mount PV systems that will be deployed during the next few decades. The impact of this ever-growing penetration of distributed, intermittent renewable energy generation makes it imperative that the grid infrastructure become more resilient and intelligent to keep the electricity flowing in a stable and consistent fashion. One critical component that will enable the successful transition is the PV inverter, which will increasingly become the brains of the solar-empowered smart grid. The increasing technical complexity and enhanced capabilities of today’s inverters show that many manufacturers are well on their way to meeting the smart inverter challenge, but not all inverter topologies and software control packages are created equal. Microinverter technology, in particular, provides some advantages to residential, commercial and (eventually) utility-scale solar. This includes high redundancy through a distributed AC architecture that improves system cost and reduces operations and maintenance complexity. An integrated microinverter package can help lower the levelized cost of energy (LCOE), facilitating higher energy production over the lifetime of the system, unit reliability and system uptime, all the while lowering systems cost by reducing installation labor and materials. Microinverters also are capable of providing a suite of advanced grid functions (AGF) required by some regulatory standards for grid stability, such as ramp rate control, power curtailment, fault ride-through and voltage support through vars. The most advanced microinverters are adaptive and essentially constitute the core of what could be called a fully networked, software-defined inverter. The benefits of such a software-controlled system include the ability to provide grid support services in an evolutionary manner over the more than 20-year lifetime of the inverter platform through software updates that can be done without any hardware replacement or truck-rolled, hands-on labor. Although the amount of solar power on many parts of the grid in the United States is growing fast, it remains quite low as a percentage of the overall generation mix. There is one state, however, that is already providing a glimpse of the high-level PV penetration future: Hawaii. 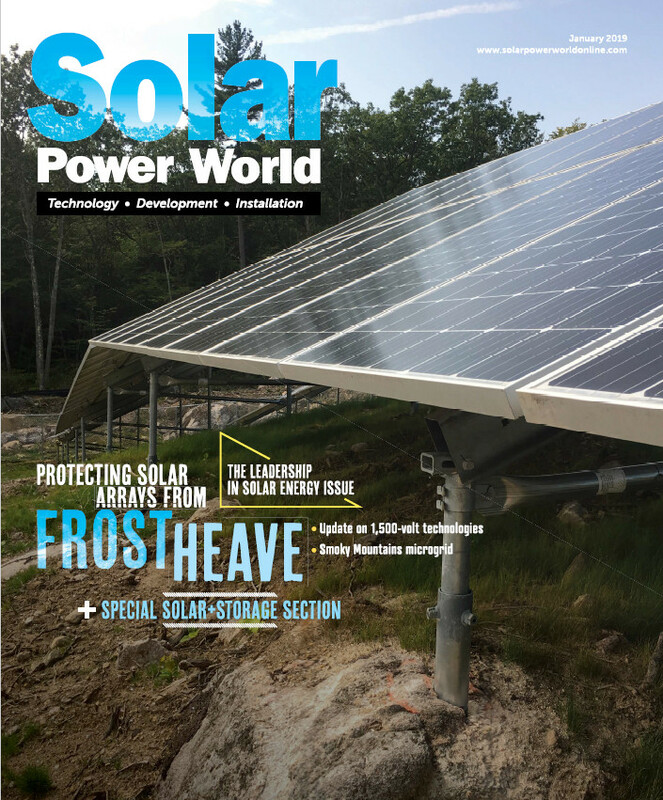 As the following case study reveals, the benefits of fully networked, software-defined microinverter architectures have already been experienced in the 50th state by customers and utilities alike. A major Hawaiian utility contacted Enphase and said that they were experiencing greater voltage fluctuations than in the past and needed to create a wider voltage window to compensate for the variability because of the growing number of solar installations in its service area. The utility requested that the inverters expand their frequency trip limits from 59.6Hz to as low as 57Hz, and insisted that these changes be retrofitted onto PV systems that had been installed in the preceding years. Working thousands of miles away in a network operations center in the San Francisco Bay area, technicians were able to meet the utility’s new requirements and upgrade the software remotely through the bidirectional communications link on more than 400 PV systems. In addition, the company’s proprietary software platform provided the utility with an automated audit trail of all systems affected by the changes. Ongoing experiments in Hawaii are focusing on new reactive and on-demand communications methodologies that will help manage the greater distributed generation load. These advanced capabilities will not only benefit the islands’ utilities, installers and system owners, but also provide insights into what will eventually need to be done on a much-larger scale on the mainland. While the digital architecture, bidirectional communications and software infrastructure technologies that underpin smart inverters are certainly important, the companies that provide such advanced systems must also be smart in the way they collaborate on new utility requirements and standards. Such activities as the ongoing UL/ANSI 1741 and IEEE 1547 standards development work as well as the Smart Inverter Working Group (which is providing technical recommendations for the revision of California‘s Rule 21 distributed-generation interconnection statute), represent the kind of cooperative efforts that will help ensure the proper implementation of the advanced grid functionality required for the more solarized energy mix of the not-too-distant future. Raghu Belur cofounded Enphase Energy with Martin Fornage in 2006. He has more than 20 years of experience in the clean energy and high-technology industries. Where can I find smart inverters with virtual oscillating control features? its like merging rocket science with typewriter. yeah current solar technology need some automation but the extent that you mentioned is a overkill. remember that technology still has got disadvantages and the anticipation of it to the near future is never possible if not think wisely. however I really think the technology mentioned is quite able to fulfill the promises. happy renewable energy. A glimpse of the coming future. I hope the mainland utilities engage constructively to implement the solar PV enabled energy landscape of the world. Great article and idea. A true distributed energy can take advantage of the regulated supply (when sun shines) and boost demand based on the supply intelligent. Great job Raghu.